No. 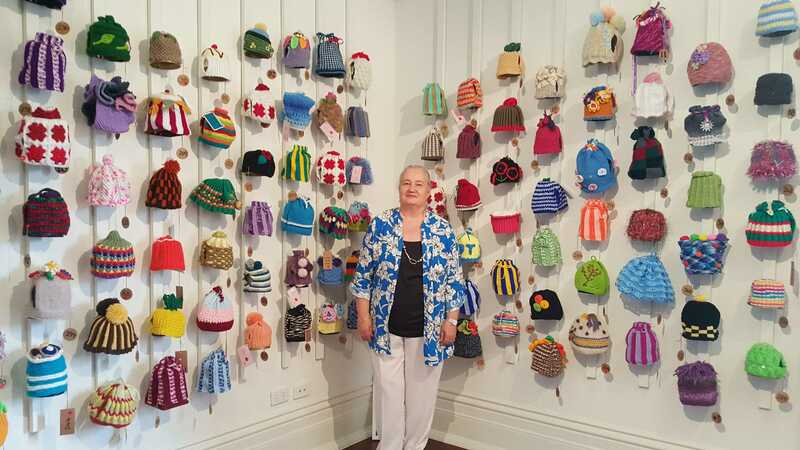 42 of 101 images: Karen Robinson viewing 100’s of Teacosies at Bundoora Homestead Arts Centre’s ‘Teavotion Exhibition’ March 2016. It was a celebration of ‘the tea cosy as a domestic icon and raises funds in support of Australian Red Cross. The teacosies were donated for sale with all proceeds going to the charity’. An extraordinary exhibition by amazing and talented crafters/artists/makers! Ref: Bundoora Homestead Art Centre. Art Therapy can present its self in many different ways, thus I am always interested in any form of art that offers the maker and viewer a therapeutic experience. The act of knitting and crocheting is one of those crafting skills that can be very therapeutic. So just the other day, when my dear neighbour asked if I would like to attend an exhibition with her, where she had donated a tea cosy (tea pot warmer) she had made with her knitting and crocheting group called the ‘Poppy Ladies’ – I said yes! Too my surprise, the exhibition was very interesting, exceeded my expectations and I had a lovely time with my neighbour and the other members of the ‘Poppy Ladies’ group from the Epping RSL Club. These wonderful volunteer knitters/crocheters, get together during each month to enjoy a free morning tea, while they knit/crochet and chat. All the items they produce go to various charity groups throughout the year. This particular group is supported by volunteer art therapists from the Australian National Veterans Arts Museum ANVAM with Tanja Johnston as head of the Arts Program. Tanja explained to me that ANVAM’s arts programs ‘are open to all ages and skill levels and participants do not require any prior knowledge or skills’. The programs ‘focus on the creative process and journey, to assist with the development of a sense of hope, purpose and pride’ in association with ‘the mastering of arts based skills’ (ANVAM 2016). 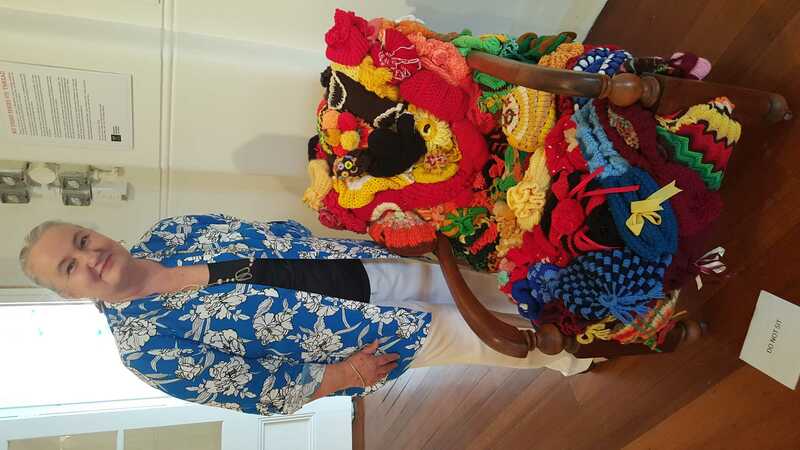 Featured above is my dear neighbour standing beside the tea cosy she had made and donated to ‘teavotion’ exhibition. I just love the array of blood red roses adorning the top and the soft colours within the knitted cosy itself. The exhibition was titled ‘Teavotion‘ and runs from 26 February to 3 April. It presents ‘hundreds of teacosies alongside of a selection of photographic portraits by artist Mark Crocker. Teavotion celebrates the tea cosy as a domestic icon and raises funds in support of Australian Red Cross.’ The teacosies were donated for sale by crafters and makers with all the proceeds going to charity. The exhibition its self was held within the magnificent Bundoora Homestead Art Centre, Bundoora – Victoria (Bundoora Homestead Art Centre 2016). Artists and crafters from across Australia display their creativity, passion, and imagination in this unique exhibition of over 380 tea cosies. Teavotion celebrates the tea cosy as a domestic icon and raises funds in support of Australian Red Cross. All of the handmade tea cosies have been donated for sale at the exhibition, with all proceeds going to the charity. The creative responses to the humble teapot are many and varied. From cuddly animals to abstract compositions, you will no doubt find cosies that are unusual and captivating. Marg Lane and Maranne Noonan, who coordinated this exhibition, have done a marvelous job and Darebin City Council thanks them for their tremendous efforts. This is the seventh time Bundoora Homestead has hosted the tea cosy exhibition. Over the last few months the gallery has offered a free space for creative types to come together and knit and crochet towards their unique vision In many ways this project is just as much about the joy of making and sharing together as it is to celebrate the creativity of others. Teavotion also presents a series of photographs relating to tea cosies by Queensland based photographer Mark Crocker and from Thursday to Saturday throughout the exhibition artist in residence Phil Ferguson will be busy making new craft-based works. Drop by and say hi! The tea cosy story began in Britain in the 1660s when tea was introduced to Britain and its first documented use was in 1867. The tea cosy’s primary function was to keep the tea-pot warm by surrounding the teapot with an insulating cloth, so that affluent upper class women during their afternoon tea could chatter away, network, gossip without their tea getting cold. Tea cosies were also a way for these same ladies to show off their needlework skills such as needlepoint, crewel, embroidery, ribbon work and were made from wool, cloth, lace and with some being crocheted or knitted. The tea cosy became part of middle class households in the late Victorian era when tea became more affordable. Tea cosies began as tea-pot warmers, but over time, became themselves, an important historical story telling item about family history and culture through creative and unique designs, patterns and colours, and varying styles and materials. My memories of making a cuppa for my mother still resonates strongly in my childhood memories. Making a pot of tea, placing a tea cosy over it was a simple but important way to take a break in the day, to sit and just talk with my mother. And there were the biscuits to accompany the cuppa as well which was just a wonderful treat. These days it’s about coffee much more than tea but the process of taking time to choose a coffee and put a moment aside, to take time out of one’s daily life and have a cuppa, a chat, stills serves as an important ritual. I remember more about the act of tea making than the tea cosy but it was part of my early Australian family story. The creating and making of tea cosies, using unique designs and patterns, using multitudes of colour palates, extraordinary varieties of materials, masterfully executed by skillful hands – still lives on today. 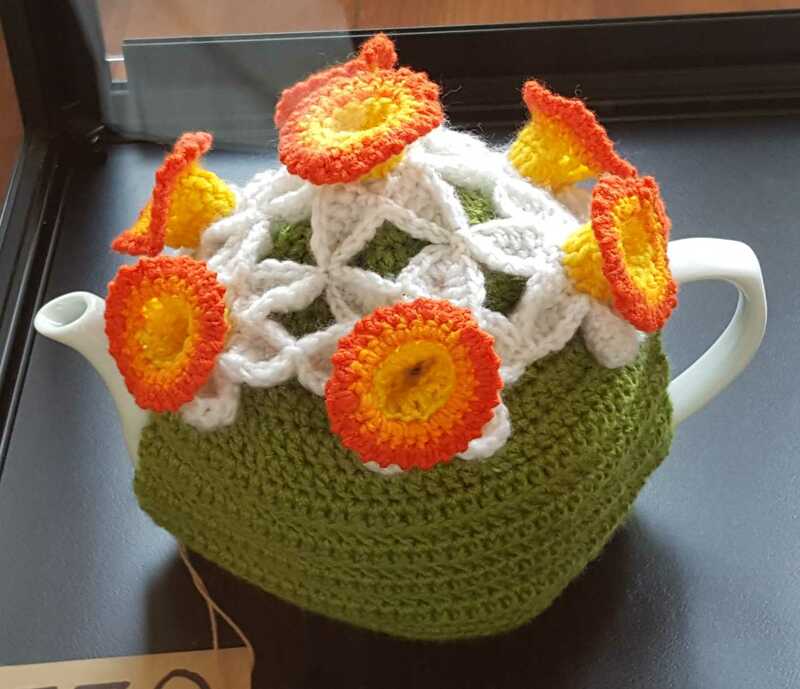 I was able to witness some of these tea cosies works of art at this worthy ‘Teavotion’ exhibition and I was just so impressed with how imaginative these wonderful crafts people are and below are some photos of their tea cosy art works. This entry was posted in Art as Therapy, Art Exhibitions of other Artists, Art Therapy Group and tagged Art Therapy, Artist Blog, Australian Red Cross, Bundoora Homestead Arts Centre, Group Therapy, I do art Karen Robinson, Karen Robinson, Knitting & Crocheting, Photography, Poppy Ladies, Teacosies, Teavotion Exhibition by idoartkarenrobinson. Bookmark the permalink. Hi Karen, The tea cosies are beautiful, colorful and so wonderfully created. Your photos of them were also. Good morning Karen….I love tea cosies and have one that is about 100 years old….it depicts an old English cottage owned by one of my ancestors….these are lovely….Hope you are enjoying a lovely day….and a good cup of tea:) Janet .